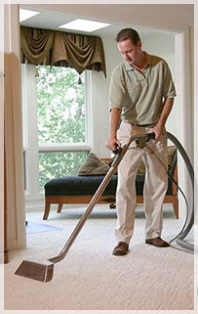 What are the major benefits of regular carpet cleaning? Clean floors reflect bright homes and regular carpet cleaning is required to maintain them in great condition. Carpets not only enhance the look of your interiors but also helps you to keep you warm in winters. These beautiful floor coverings are available in various colors, designs, and materials and can be selected depending on your requirements and budget. There are several reasons why carpet cleaning should not be neglected, and one of the main reasons is the health of your family and pets. Clean floors mean dust and dirt-free homes which are the leading causes of allergies and other respiratory problems. Here are few important reasons for getting the carpets cleaned and maintained on a regular basis around the year. Regular cleaning of floors extends the life of the carpet and using the extraction method ensures the long life while protecting your flooring investment. The fibers traps dust and airborne pollutants over a period which can result in causing allergies and other respiratory problems for your family members. Regular cleaning of carpets ensures that these airborne pollutants are extracted which promotes indoor air quality. Moreover, if you have pets at your home, the pet hair needs to be removed to prevent concerned allergies. Regular carpet cleaning prevents dust and dirt from settling into the fibers which not only extends the life of the floor material but also facilitates easy maintenance. A regular schedule ensures that the dry soils are removed from time to time before it gets into the deeper layers. Only vacuuming of the floors may be required to remove the dry soils. Scheduling regular cleaning of carpets can remove spots and stains that attract more soiling which can cause damage to the flooring investment in the long run. These spots and stains on the fibers not only give an ugly look but also can result in irreparable harm. Removing them promptly can protect the material from future damage due to excess soiling. If your floors are not washed on regularly, there are high chances of the build-up of allergens and bacteria. The settled dirt and dust on the fibers can become a breeding place for bacteria that can cause allergies and respiratory diseases. Regular carpet cleaning prevents the build-up of bacteria, allergens, and other unhealthy contaminants. Shiny floors for sure enhance the appearance of any room. A stainless and spotless floor speaks volumes of the overall tidiness of the place or home. Cleaning carpets regularly will keep them new for a long time. Regular carpet cleaning maintains the material and extends the life of the flooring investments while removing the dust mites and bedbugs that make floors and rugs as breeding homes. Cleaning regularly maintains the warranty of the carpet which specifies that washing by extraction method is required once in every 12 to 18 months.